The weekly gig began as an open stage, says Roe: “We didn’t know enough material to fill even the hour and a half we were booked for, so we put out a call to pretty much any musician that we knew.” But it’s since solidified into a loose-knit nine-member combo of considerable verve, shaking the roof of the cozy Northeast bar with Depression-era blues and gospel tunes. The band takes over the 331 this weekend to release its sprightly second album, The Owl And The Bat And The Bumblebee, headlining Friday night with Lisa Fuglie & Mark Anderson and The Cactus Blossoms, and Saturday night with the Como Avenue Jug Band, as well as performing an all-ages in-store at the Electric Fetus on Saturday at 3 p.m. The Roes sat down with The A.V. Club to talk about balancing murder ballads with kids’ lullabies, and winning the Stanley Cup of waffle irons. The A.V. 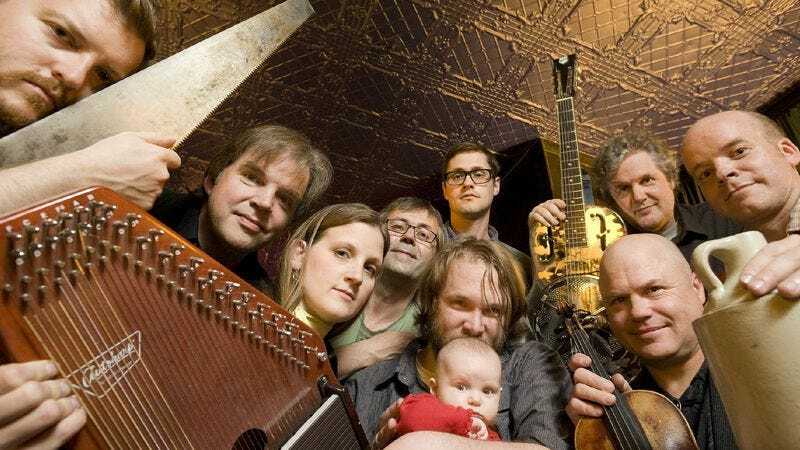 Club: What does folk music from 80 years ago or more have to say to people today? QR: [There’s] an old song called “How Can A Poor Man Stand Such Times and Live?” And I think that, although we’re not in a recognized depression, you’d be hard-pressed to find any average person—not a wealthy person, but middle- or lower-middle or lower-class person—who thinks that we’re not getting back there again. There are definitely lyrics that speak to that. There’s a lot of political activism hidden in these songs, and some are more overt. In the 1950s and 1960s, which is starting to become part of the classic canon now, you had Merle Travis writing songs like “Dark As A Dungeon,” about what it’s like to work in the coal mines. We still have people getting murdered by the coal mines, through cave-ins, or mountaintop removal destroying the streams and the ecosystems in these places all over the states. At the same time, we are living in these times that are maybe more and more aggressive, more narcissistic, more insular. You’ve got this music that’s been around, probably stuff your grandparents listened to. You’ve probably heard it somewhere before, so there’s a comfort to it, and it’s simpler. It’s meant to be fun, also. We were just talking this morning about the song “Knoxville Girl.” It’s most famous from The Louvin Brothers, but it really goes back 300 years in slight variations. But it’s always been presented as this jaunty melody—but it’s this horrible lyric about beating somebody to death and dumping their body in a river. QR: Even songs that are speaking about this dark part of who we are, as a person or as a culture, are framed into a dance melody. “Knoxville Girl” is a waltz, and who doesn’t dance to a waltz? AVC: Having said that, your new album is a lot lighter in tone than your first disc, The Earth And All That Is In It. There aren’t any songs here like “White Horse,” about a woman’s slow descent into heroin addiction and doom. QR: We’re past that stage in our lives now. We’ve both kicked, so what is there to—[Laughs, then holds up his hands.] I shouldn’t make that joke. I made that joke once with Accident Clearinghouse, and they printed that I was a recovering heroin addict. For the record, I am not a recovering heroin addict! I’m too big to be on heroin. [Laughs.] I’m too stocky. AVC: Why move away from the darker material? QR: We wanted to do stuff that we could do with our kids and play for other people’s families at farmers’ markets, and other places that aren’t bars—which we’re doing more of, thankfully, because then our girls can go. I was kind of shocked by how many references [we got] to The Handsome Family, and all these really dark things. AVC: Part of that had to do with you both being husband-and-wife country duos, though. QR: Life is going to be hard anyway. We were more interested in strengthening our children with a message of love and hope. They’ll get the other stuff without us trying. Better to raise them up with a positive message, so when they run into these bad things, your first reaction isn’t to shut down or brood, but to meet the challenge. Whether you can do that or not is another thing. That’s the human condition, right? AVC: And a lot of the traditional songs are also classic kids’ songs, like “O Susannah,” which is on the new record. KR: We started doing “O Susannah” because it was our oldest daughter Elspeth’s trying-to-get-her-to-sleep song. AVC: In 2010, you won the annual West Bank Battle Of The Jug Bands and took home the grand prize: a waffle iron. QR: Yes! Not just any waffle maker. That was a ton of fun. We played in our underwear—union suits with big whiskey barrels. Kim had a barrelkini with our daughter Elspeth on her back. KR: We came in just at the last minute. If you’re late and don’t show up, you forfeit your turn. We were the very last band to play. AVC: You also won a more prestigious prize this year, the McKnight Artist Fellowship For Performing Musicians. KR: We didn’t think that we were a good fit for it. We didn’t think we had a chance. QR: But in the space of two days, we got three e-mails from totally unrelated people saying, “Hey, did you guys know it’s the McKnight deadline? You really should apply.” So we said, “Okay, we’ll try, and if we lose, we lose.” But we went in thinking we were going to win. I took the mindset that if the only choice we give ourselves is to win, then we can do it. We got the phone call saying that we were one of the four winners in the middle of a gig. It was like you see in the movies, where Jerry Lee Lewis first hears his song on the radio in Great Balls Of Fire. Everybody was jumping up and down and hugging and slapping fives. Going crazy. AVC: So which is better, the McKnight or the waffle iron? QR: That’s tough. You can eat the waffles. We’ve had some pretty good times with the waffles. [Laughs.] But honestly, winning the jug battle was every bit as exciting for different reasons. That battle’s been going on for 30-plus years, and the waffle iron has the names of all the past winners engraved on the top. AVC: Like the Stanley Cup. QR: Yeah! Absolutely it is. You take it home with you for a year, and make waffles with it. It really works. We used it to have big waffle breakfasts with the band. It comes with a homemade velvet pillow with tassels and a carrying rucksack. There’s names on there like Spider John Koerner and Bill Hinkley—all these great bands and local legends. To be in the same company with them is a true honor. Koerner, Ray & Glover were another one of those groups that, like Dwight Diller, changed my approach to music. Blues, Rags & Hollers blew me away the first time I listened to it.